The views of hawks like John McCain are part of that discussion. They need to be heard and they are. What’s wrong is the snarky insinuation from McCain and others that the real problem we face is personal--that America, under Obama, has become the wimp on the beach, encouraging bullies like Vladimir Putin to kick sand in our faces. This personalization of a geopolitical rivalry is irresponsible and dangerous: our guy (the one who took out Osama bin Laden and was ready to bomb Syria) is a wimp and their guy is a real man because he posed bare-chested on a horse, threw girl singers in jail for annoying him, and bullies essentially defenseless states on Russia's borders. The comparison would be just more tabloid nonsense if it weren’t for the fact that the real cowards in this country—the chicken-hawk politicians who won’t stand up to the braying of the Radical Right--are pushing the President to “do something” that their Fox-addled constituents can feel good about. I mean, diplomacy and economic sanctions are so, well, girly-man--never mind that the very threat of sanctions caused the Russian stock market to shed $60 billion in a day. If Obama were a real man, say the chest-thumpers, he’d at least push NATO eastward, conduct live-fire exercises with the Ukrainian army or blockade the Russian Black Sea fleet. That would make that bare-chested Russian back down (Oh wait, do those guys still have nuclear weapons?). And those pointy-headed analysts who suggest that the US could, within a decade or two, substantially undercut Russian global power by flooding Europe with cheap natural gas from North Dakota—well, that’s like a trick play in football; you take the points but it would have felt so much better to smash your way to the goal line. In the US Foreign Service, I planned nuclear war for NATO so I know the challenges that Russia poses. 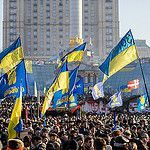 Obama, with his steady escalation of nonmilitary moves in sync with our European allies, is making sensible choices in Ukraine. Yet the Radical Right-- who depict themselves as the “real patriots” in this country--demean their own President and gaze with admiration on a corrupt, bullying autocrat who despises this country they profess to love so much. Their definitions of “manhood” have never evolved beyond the sandbox. Let me personalize this. Bullied at school, nothing was more important to me than “becoming a man” and the only models that attracted me as a youth were tough, macho men. So that’s what I became. At 71, you still don’t want to mess with me. But at some point in my late thirties I realized that relying on a definition of manhood that may have worked for hunter-gatherers did not work for me nor for the times we're living in. Machismo was only part of who I was. And it led to nothing but unhappiness, for me and those around me, and for the public policies I influenced. So I changed. Learning to be tough and compassionate at the same time, balancing head and heart in crises and challenges, has taken more resolve and courage than any of the physical exploits that defined my early life. If I’ve done anything in the last thirty-five years that helped solve public problems--such as contributing to the end of apartheid or helping start a global organization that promotes courage--it’s been because of this shift away from a stunted definition of what it means to be a man. So yes, I don’t have much patience with the hypocritical braying over “manhood” by the Radical Right, most of whom I'm betting have never done a tough thing in their lives. I’ve no respect for their attacks on “emotion” in politics when no one is more emotional, and more dangerously so, than they. Why should we let their infantile needs to look tough ratchet up the anger and fear that lead to actions that make our nation less, not more, secure? It's a cruel joke that even as modern technologies, trainings and conditions allow us to be more sophisticated, more forward-looking and less ruled by emotions—too many people who should know better insist on marching in the opposite direction. I’m a practical political person who’s lived long enough to understand what works and what doesn’t in my own life, to absorb the scar tissue formed along the way, and to dare to suggest that some of these lessons apply more broadly. I hate to see people do stupid things, especially when they put the whole country in the fields of risk they create by their stupidity. A national debate on a serious matter of global security that descends to a fight over bully/wimp stereotypes is worse than stupid. It’s insane. Shame on those that feed off and abet this ignorance. Correcting the underlying problem means starting early. We are a society that does very little to teach its boys to become men. We are a society that does little to help young people of either gender question definitions of success that depend on manipulation, conquest and power. Young people, especially, need models of real men and real women, people who are tough, brave, honest and compassionate, working for the common good, helping solve significant public problems. There are plenty of these examples. We need to tell the stories of real heroes like these to each other and especially to our young. We need to bethe stories ourselves, modeling what it means to be a man, a woman, a citizen in these fragile and dangerous times.